Although individuals spend the majority of their time indoors, most epidemiological studies estimate personal air pollution exposures based on outdoor levels. This almost certainly results in exposure misclassification as pollutant infiltration varies between homes. However, it is often not possible to collect detailed measures of infiltration for individual homes in large-scale epidemiological studies and thus there is currently a need to develop models that can be used to predict these values. 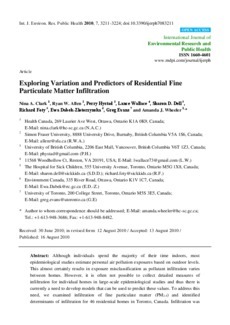 To address this need, we examined infiltration of fine particulate matter (PM2.5) and identified determinants of infiltration for 46 residential homes in Toronto, Canada. Infiltration was estimated using the indoor/outdoor sulphur ratio and information on hypothesized predictors of infiltration were collected using questionnaires and publicly available databases. Multiple linear regression was used to develop the models. Mean infiltration was 0.52 ± 0.21 with no significant difference across heating and non-heating seasons. Predictors of infiltration were air exchange, presence of central air conditioning, and forced air heating. These variables accounted for 38% of the variability in infiltration. Without air exchange, the model accounted for 26% of the variability. Effective modelling of infiltration in individual homes remains difficult, although key variables such as use of central air conditioning show potential as an easily attainable indicator of infiltration.